The president, en route to California, maintained he didn't flip-flop on when he might shut down the U.S. border with Mexico. President Donald Trump headed down to the southern border on Friday — and offered some rare warm words for Mexico en route. Trump, who'd threatened to shut down the entire border this week "if Mexico doesn't immediately stop ALL illegal immigration coming into the United States," had changed his tune on Thursday, saying he'd give them a "one year warning." He told reporters on the White House South Lawn on Friday that he hadn't reversed his position. "I never changed my mind at all. I may shut it down at some point, but I'd rather do tariffs" as a penalty, Trump said. "Mexico, I have to say, has been very very good, you know that, over the last four days, since I talked about shutting down the border. If they continue that, everything will be fine." "They're apprehending everybody. Yesterday they apprehended 1,400 people, the day before a thousand. If they apprehend people at their southern border, where they don't have to walk through, that's a big home run. We can handle it from there. It's really good," he said. He again called on Congress to reform immigration laws, saying they should "get rid of the whole asylum system" and "get rid of judges." "Very important Congress acts," Trump said. Immigration experts told NBC News Mexican officials weren't actually doing anything new. "Mexico has been apprehending and deporting migrants consistently since 2014. This is not new," said Rachel Schmidtke, a program associate at the Mexico Institute of the Woodrow Wilson International Center. Ariel Ruiz Soto, an associate policy analyst with the Migration Policy Institute, said that "they are doing the same kind of enforcement as they did under the old [Peña Nieto] administration." "The thing that has changed is that there is a larger flow of migrants from Central America, and Mexico is apprehending and detaining more people simply because of the larger flow," Soto said. "It’s not true that Mexico is doing something specifically new as compared to before." Trump had received tremendous pushback over his threats to shutter the border, which the U.S. Chamber of Commerce, a conservative-leaning, business-oriented lobbying organization, warned would be "an unmitigated economic debacle" because the U.S. and Mexico trades about $1.7 billion worth of goods daily. Senate Majority Leader Mitch McConnell, R-Ky., said such a move would have "a potentially catastrophic economic impact on our country." On Thursday, after Trump backed down from his threat of imminent border closure, said he could still slap Mexico — the country's third largest trading partner — with tariffs before that if they don't slow the amount of immigrants and drugs coming across the border. 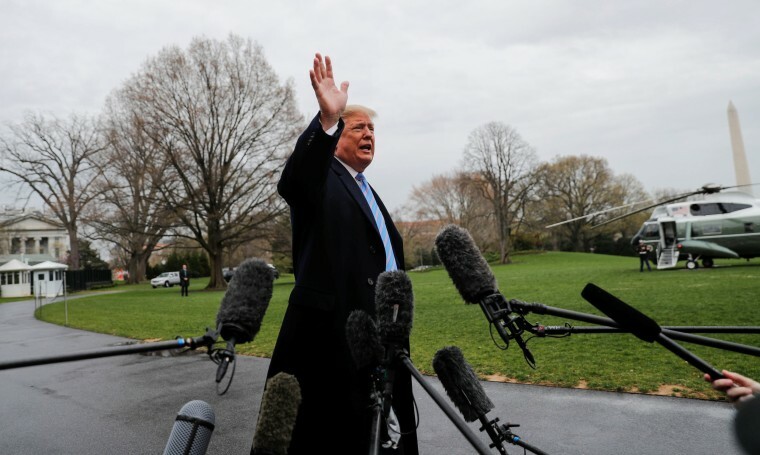 "If it doesn't work, which it will 100 percent," Trump said Friday, "I would close the border." He said he's also "looking for an economic penalty for all the drugs that are coming across the southern border and killed our people." Asked if the tariffs would violate the trade deal he worked out with Mexico and Canada that still needs to be approved by Congress, Trump said his tariffs would "supersede" that.